I won't be able to talk about this at length like I did with Boogie Nights yesterday, because my relationship is different with this film, but it is my favorite of PTA's. Barry is the character I most relate to in cinema, to go into why would turn this into a Psychoanalysis session- we don't need that. Annnnnnnnndddd I haven't seen it in a really really long time! I guess today would be as good a time as any to watch it, but I need to get a bigger TV! well then, this should be the perfect opportunity to release it on blu ray. in fact, ask him about that if you (or someone you know) interview him. 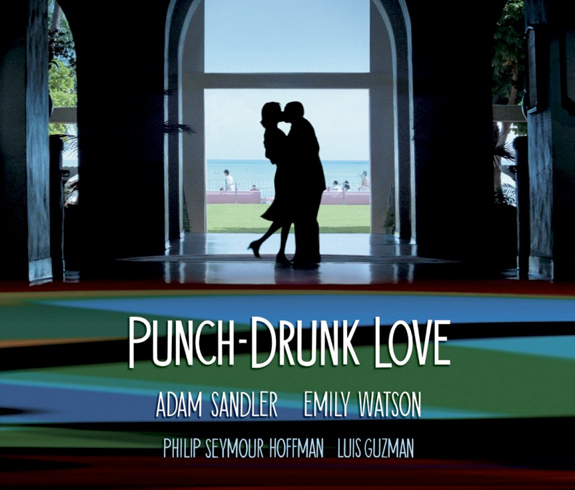 I asked Paul tonight, and he said Punch-Drunk Love Blu-ray release will be out next year, he's working on it now. Also he thinks Kubrick is incredible, and has left the biggest watermark in cinema, feels really fortunate he had the chance to meet him. I also had a fan's plea for him to record commentaries, he said he might do some, even though he doesn't necessarily enjoy recording them. He signed my original Magnolia poster. One of the best evenings of my life. Also when asked about if this auditorium was his lecture, and he was the film school professor, what film would he show. He said "Ted", that it was truly hilarious and so well written, one of the funniest/best films he's seen recently. That a film like "Ted" just takes you back to the core of what films are about, enjoyment. I wonder if this was recorded for a possible Criterion release, I would guess like an audio track, but live film of the live show synched with the movie would be cool, too. This score has so much percussion I'm guessing there had to be a guy with a bunch of percussion instruments. anyone else go to this? they got started without an intro so i had no idea newsom was there until she started singing. brion played the keys (three different keyboards to be exact) and had some sort of contraption behind him. lights went down, movie played with live score, spotlight on brion during the credits, he sang "here we go" to close out the credits, and that was it. was hoping for a bit more to the evening but still fun. loved seeing it again and hearing the music live was nice. thought the mix could've been better though. never really got the full impact of hearing an enormous orchestra perform music in front of me. i'm assuming they didn't want to blow out the rest of the film's sounds. most of the audience erupted in cheers anytime psh was on screen, which i found to be a bit... strange.